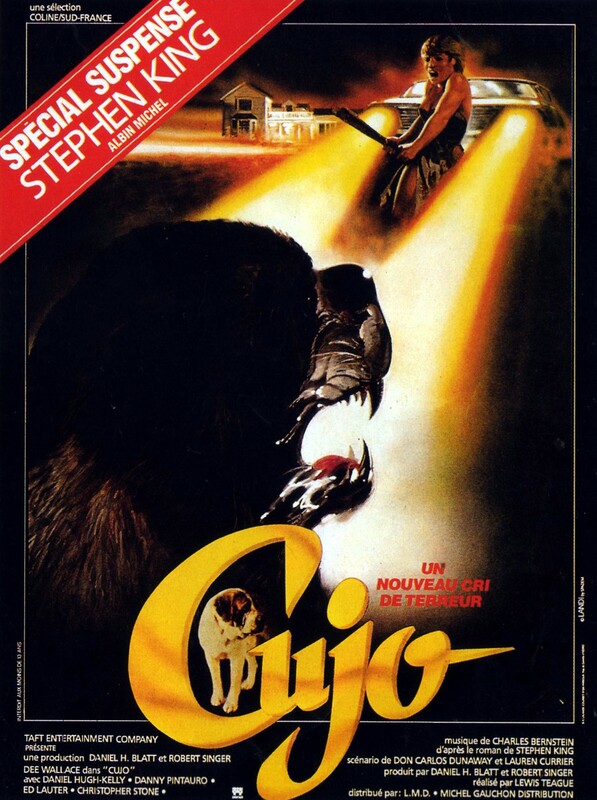 When Steven Spielberg unleashed the terror of Peter Benchley’s novel upon innocent movie goers in the summer of 1975, it opened up a whole sub genre in horror of animals on the attack. 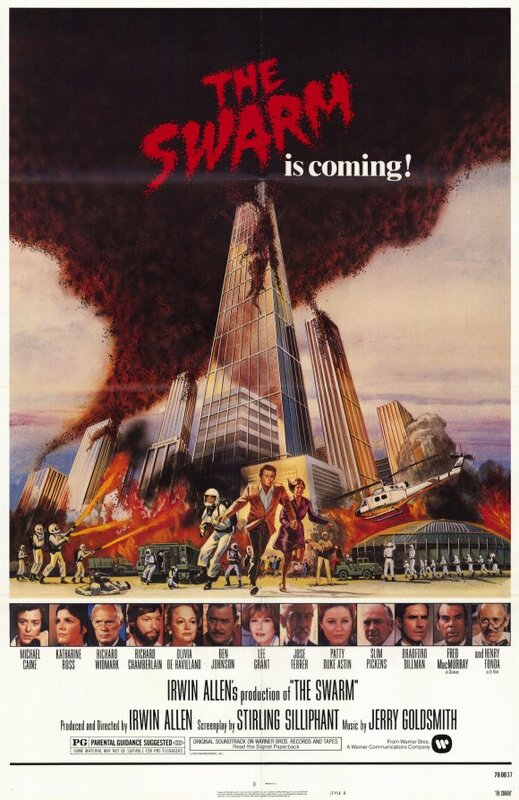 While there had already been a few films released prior to Jaws featuring attacking animals aka The Birds or how about Willard and his rats, this one set the bar for everything to come in the past 40 plus years. 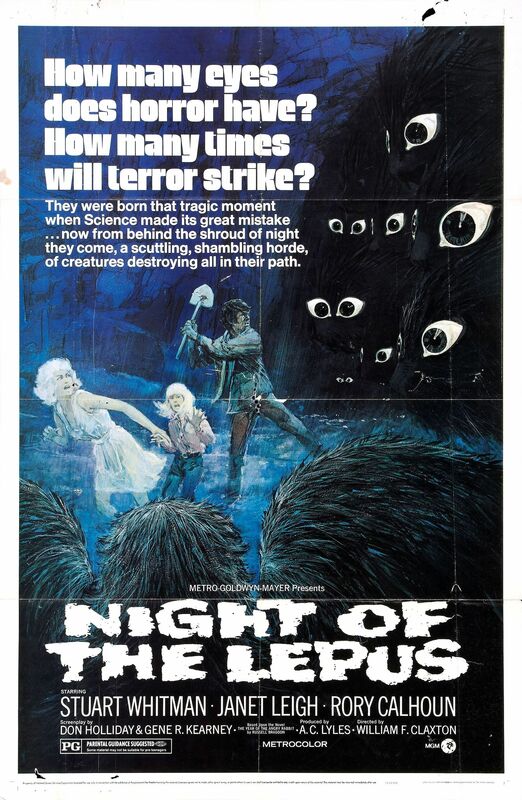 It shouldn’t come as a surprise that the Great White Shark had a more profound effect on the paying public than rampaging jack rabbits did in Night of the Lepus, a title that has to be seen to be believed. 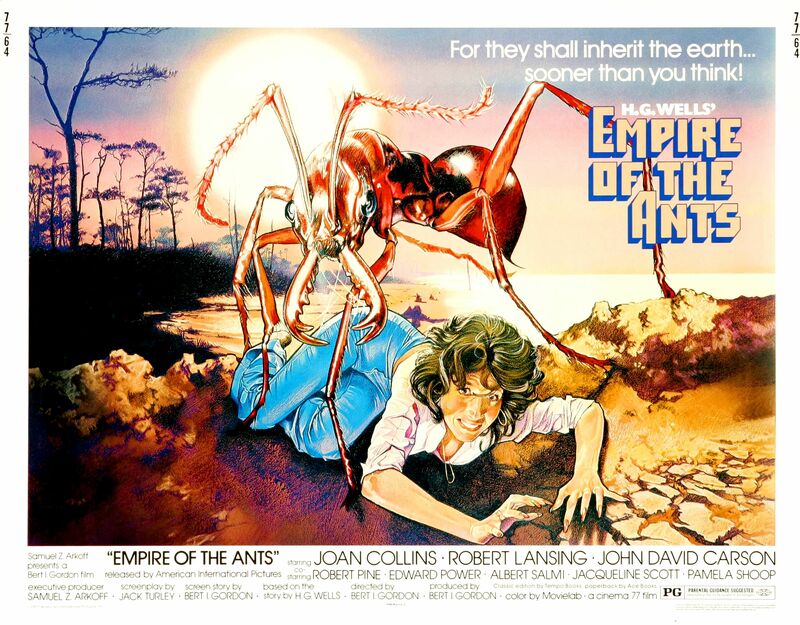 More so considering the casting director managed to land the likes of Rory Calhoun, Stuart Whitman, Janet Leigh and DeForest Kelley to join in the fight against the marauding, oh so cuddly bunnies. 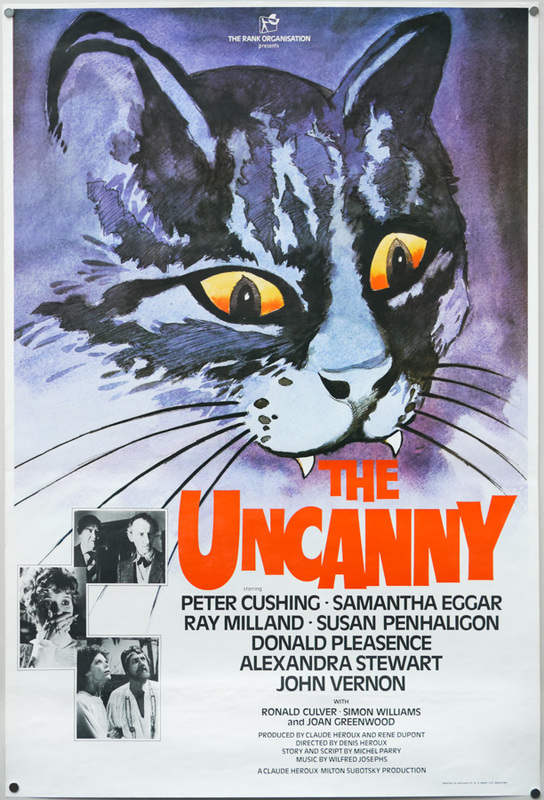 Kitty cats had Peter Cushing terrified and relaying a series of tales to Ray Milland in this Canadian Production from Milton Subotsky. Dino De Laurentiis brings us a couple of titles. One with Richard Harris …. and the other a box office dud that deserved better for it’s iconic star. What’s the best form of flattery? How about an oh so obvious right rip off. Did the success of JAWS get Bert I. Gordon the go ahead for his latest idea? 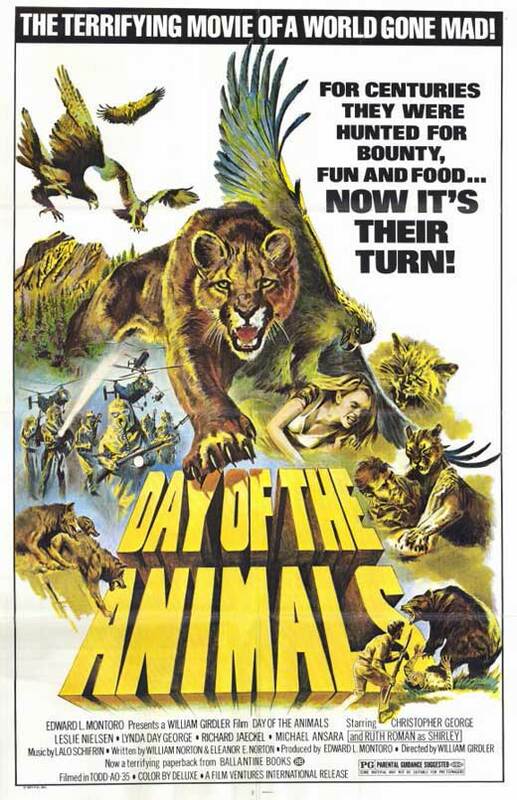 How about a bit of everything when Leslie Nielsen decides to go mano a bearo when the Day of The Animals is upon us. Man’s Best Friend could fill this latest idea for me to feature some classic poster images. 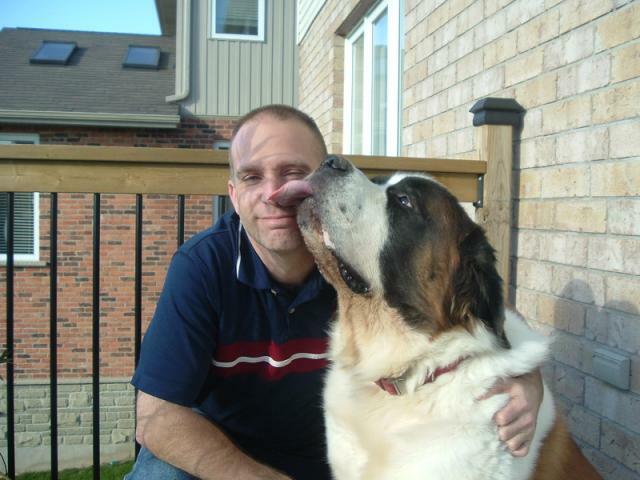 Here’s a special section dedicated to our furry friends. and of course…. always a popular film with my Samson. 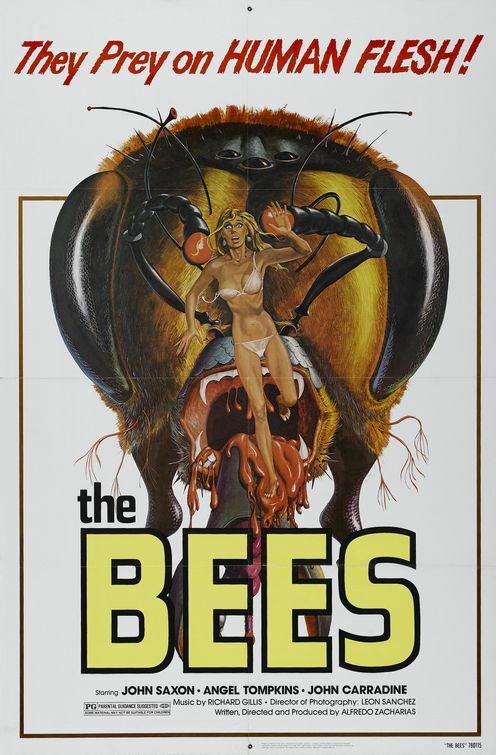 Did JAWS create the Killer Bee sub genre? I could be convinced. 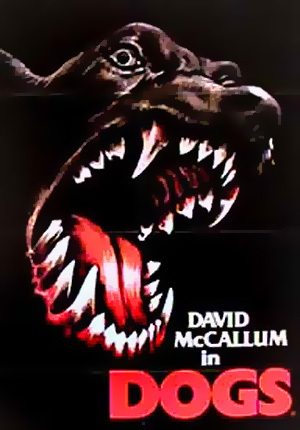 Easily one of the better JAWS rip offs and highly recommended would be this Robert Forster thriller. I could go on and on here if I began to feature countless foreign films and straight to video flicks but do I have a favorite JAWS influenced flick? You bet. 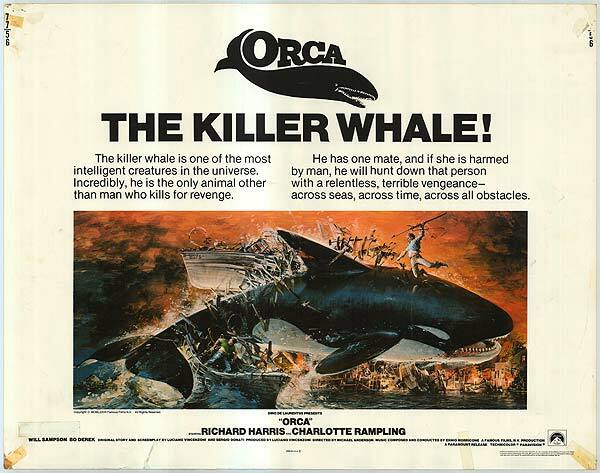 It’s pretty much a by the numbers remake moving the action to the forests with Christopher George, Richard Jaeckel and Andrew Prine taking over for the trio aboard the Orca. 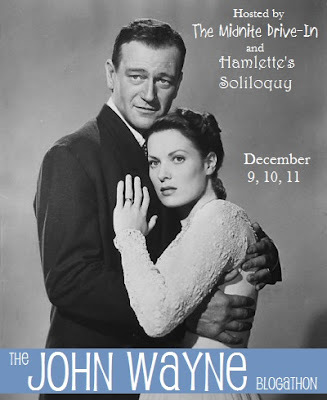 Love those posters! 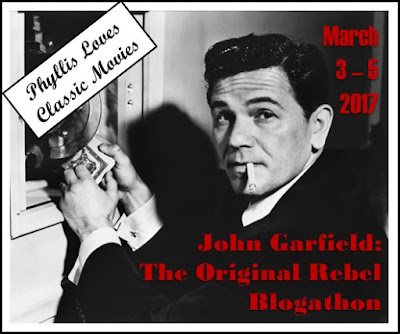 Some pretty lousy movies there but a few that are quite good too – I saw a number of those in the cinema when they were released (I must have been under the age limit but things seem to have been a good deal slacker in that regard in Ireland back then) I kind of miss that era now. 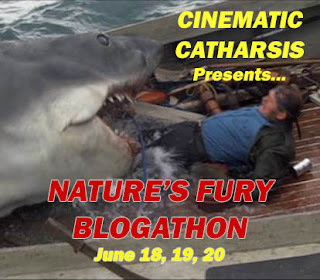 Just cause they were “inspired” by Jaws and aimed at making money doesn’t mean some were well done and entertaining. Forgot to sneak poster for Piranha in here. An obvious choice. Hey, I’ve actually seen a lot of these! 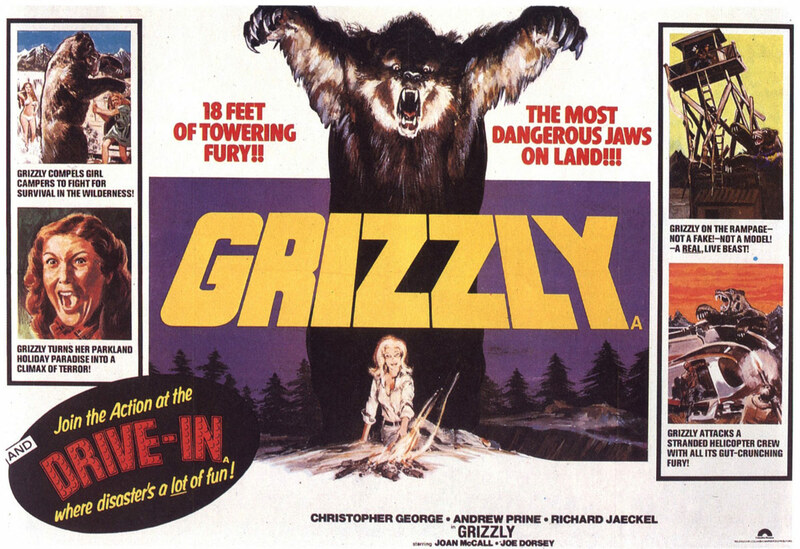 And of them all, I’d say ‘Grizzly’ most closely parallels the events of ‘Jaws’. 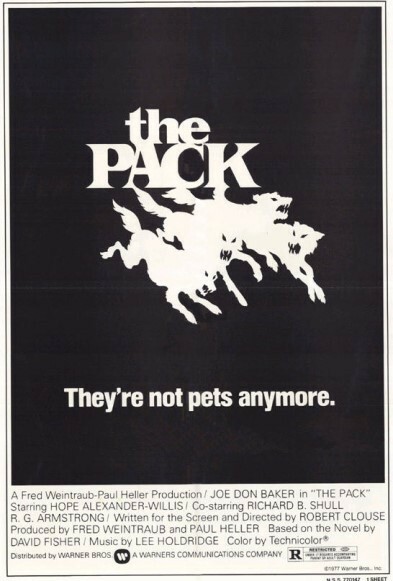 And I like the simplicity of the ad for ‘The Pack’…and the whacked-out ending of ‘Empire of the Ants’…and that’s quite a cast list for ‘The White Buffalo’. 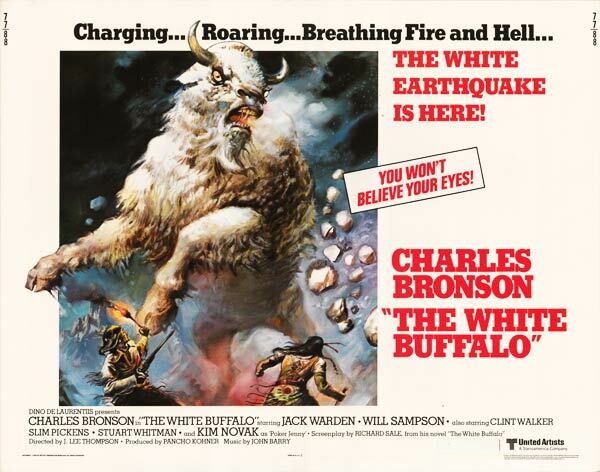 And finally…I’ve never even heard of ‘Great White’! 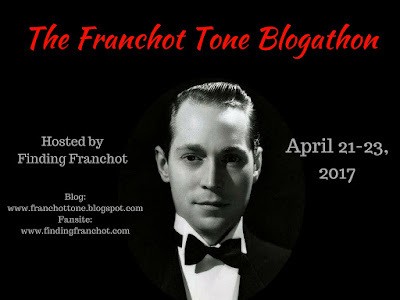 But it stars James Fransiscus, so it can’t be all bad, can it? Is that him on the airbed? If it is, then he definitely had some work done. Not quite.lol but he tries to be her hero in this Italian ripoff. He’s go the Scheider role. 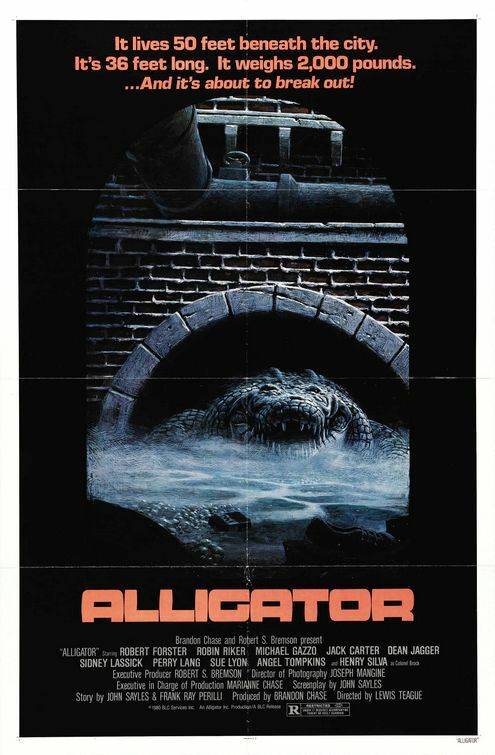 Plenty of fun in here and I have The one sheet for White Buffalo and Cujo, Alligator, Great White and Zoltan. Some day I’ll release them from the vault. I guess I already have for Great White. lol. A fine collection! Ah, yes, happy memories of some of those . . .
Good old Milton Subotsky. 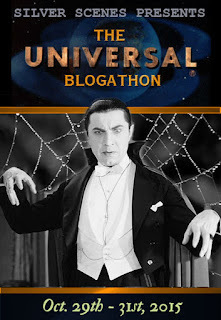 He once decided not to film a novel I cowrote on the grounds that he couldn’t afford the special effects.My coauthor and I had thought there were plenty of other good reasons not to film it, but we hadn’t liked to say. Sounds like a good story in here, have you written a post about it? If not please do. 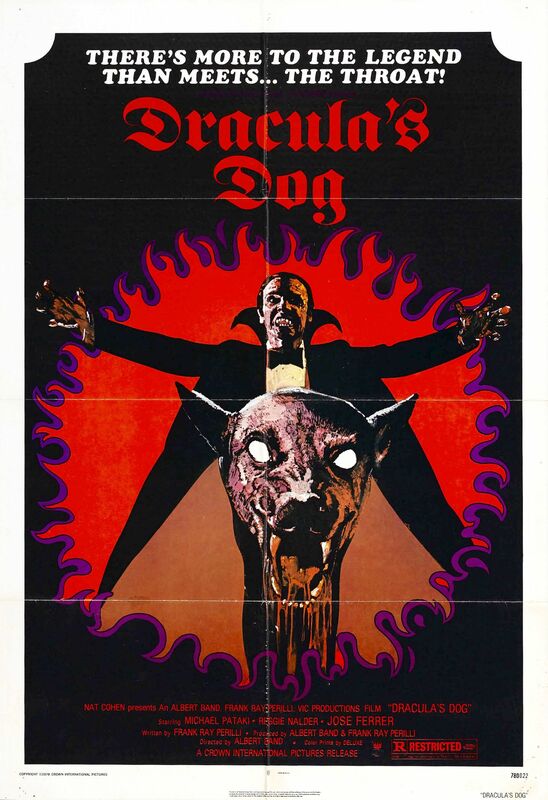 Great movie posters. When Hollywood has a blockbuster, similarl films are sure to follow. Studios and producers are always looking to cash in. Still goes on today. Too bad posters today are not as cool. No more art work involved. Just photo shop stuff. 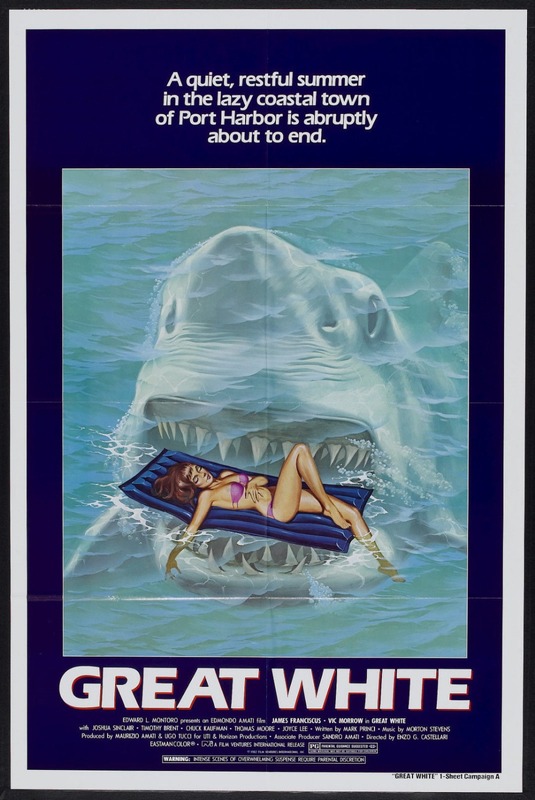 As impossible as it seems legally, I still want to see Great White pop up on a Blu-Ray one of these days, grrrr. 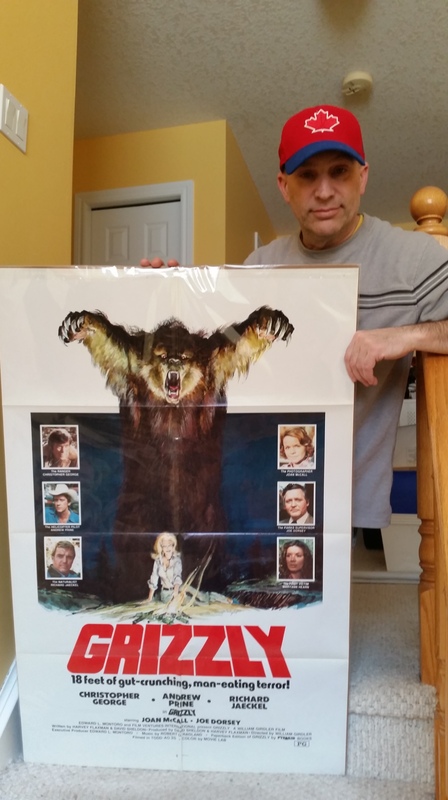 Anyway, that Grizzly poster always made me laugh because it’s by Neal Adams and for years I didn’t know it until someone pointed it out to me. Up until that point I thought it was someone swiping his style! Kind of doubt that will happen, have you seen Great White? I have a copy I picked up at that film fest I go to near Pittsburgh an DVD. Love that Grizz poster! I guess its all find and dandy to rip yourself off (not very well either) but heaven forbid another company swim into your waters. lol.